In our previous episode, our hero (me) was brainwashed by his evil friend, Juliet, and his evil wife, Kattina, into taking his first ever evil salsa dancing class. Halfway through the class, our hero experienced an EPIC PANIC ATTACK (!) and swore he would never salsa dance again. I say this with confidence. I actually have no clue where in Singapore I might find live Irish music on a Friday night, but this small island nation has nearly a dozen Irish pubs and a big expat community. There’s got to be something somewhere. I hop the subway toward Muddy Murphy’s, the bar where I spent last Saint Patrick’s Day. On that night, a rollicking good Celtic folk-rock band called Gan Ainm played high-energy Irish tunes for several hours. Granted, on a random Friday in August, one can’t expect a re-creation of Saint Patrick’s Day, but considering the extreme measures the owners of Muddy Murphy’s have taken to make it an authentic Irish pub, I’m optimistic. No expense was spared! The magic of the Emerald Isle! As I arrive outside Muddy Murphy’s, I take a deep breath, ready to be immersed in my evening escape to Ireland. A cover band from the Philippines is playing “No Woman, No Cry” by Bob Marley. I sulk over a Guinness and some Irish stew. The band belts out a versatile mix of 50s tunes, songs by Oasis, and a pretty good rendition of “Sweet Home Alabama.” I move on. After some quick research on my iPhone, I hop the subway to Tanjong Pagar, a neighborhood full of cozy drinking establishments. 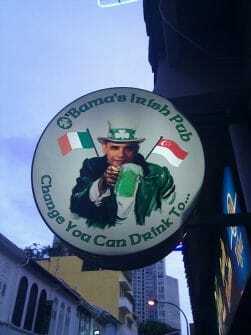 I head to a pub named after an Irish-American president. As I enter O’Bama’s, a woman on a small stage announces she and her friend will now play a song called “What’s Up?” They play a cover song that is actually called “What’s Going On?” by a group called Four Non-Blondes, a.k.a. Four Non Irish Musicians. But the bartender is friendly, and well-versed in Irish whiskeys, so I stay. Her name is Zarina. She’s Singaporean. Her boyfriend is French. I ask where I need to go in town to hear some proper Celtic music on a Friday night. Nobody knows. I like O’Bama’s though. Maybe it’s the Guinness. Maybe it’s the Strongbow. Maybe it’s the shelf with Barack bobblehead dolls next to bottles of Laphroiag. I’m having a good time. I’m having multiple conversations with multiple groups of nice people. None of these nice people are asking me to salsa dance, so life is excellent. Zarina’s boyfriend reveals more information about himself and his two cohorts seated beside him. They are not just from France. They’re from Bretagne – Brittany – France’s cider-swilling Celtic region. “So how come there’s no Breton music in this place?” I ask. The next thing I know, the band is packing up for the night, and my new Breton friends are pulling up Breton tunes on YouTube and singing along with drunken exuberance. It’s a different style of music from the Irish / Scottish folk tunes I was hoping for, but it’s authentic Celtic nonetheless. I declare the evening a strange success. 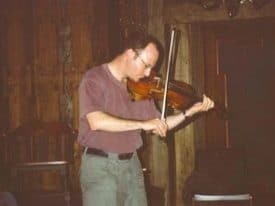 A rare performance in rural Norway… back in the days when I had hair. I eye the small stage. I tell Zarina she should not make this offer unless she means it. I happen to be a closeted fiddle player, and if I want live Celtic folk-rock on Friday nights in Singapore, I just might have to take matters into my own hands. Zarina promises she means it. So consider this an official announcement: I’m seeking Celtic-minded musicians in Singapore who want to start a band – something rowdy and Guinness-fueled. 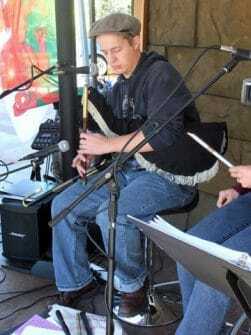 I need guitar players, a drummer, a bassist … and someone who can play the uilleann pipes. Planning Ahead for 2012: Move Leap Day to March 32nd! Heh… responses have been slow. I might have found a non-Celtic band looking for a violin / fiddle player but I’m not giving up on the Celtic rock scene. Are you in Singapore? Do you play any other instruments? Hi there, I stumbed upon your post while searching for other uilleann pipers in Singapore. I happen to play a starter set (no drones… yet) myself, although I’ve only had about a couple months worth of practice at most. Spent most of my time playing the highland pipes. Repertoire’s limited to a couple of traditional tunes and a jig (Kesh Jig) at the moment but I’m certainly looking to expand it. Perhaps we could meet up for a drink and a session sometime?